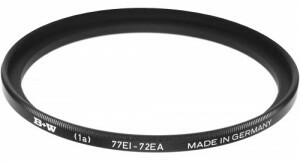 Home »Photography»Step-up Ring will save you from buying another set of filters. I have a great collection of Canon L lenses. All of them are the standard 77mm diameter which allows me to use the same set of filters on all of the lenses. When a pro-version circular polarizer costs $170, that’s a great thing. Well, I just bought the iconic Canon 85mm F/1.2 II L lens. For some reason, Canon designed this massive lens with a 72mm diameter instead of the standard 77mm. Now I could spend another $500 on filters for this size or I could spend $20 and buy a Step-up Ring. A Step-Up Ring looks just like a filter. There is no lens in it, so it really is just a ring. There are two different sized threads, one on each side of the ring. In my case, I purchased a 72-to-77mm Step-up Ring. They are offered in most standard sizes. One important note — you should only consider a step-UP ring to go from a smaller lens thread to a larger filter thread. If you were to Step-DOWN, you would create vignetting around the edges of your image. ← Previous Previous post: What’s your leave-behind? Try a USB Flash Drive with your logo.